Animal Welfare Op-Shop Rockingham supervisor Trish Pendlebury with the fake $50 she discovered. 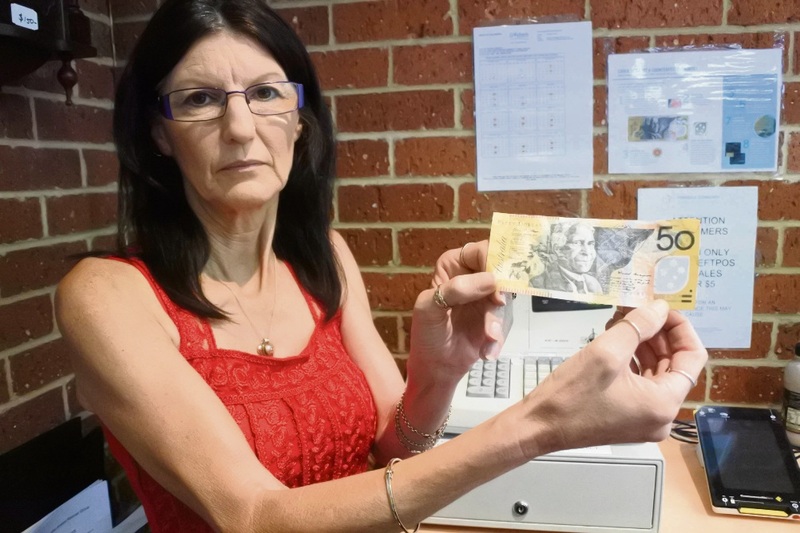 BUSINESS owners are being warned about counterfeit $50 notes circulating in Rockingham. Animal Welfare Op-Shop supervisor Trish Pendlebury will be sending a counterfeit $50 to the Federal Police. She said the counterfeit note came through her store and another business owner showed her the tell-tale signs it was a fake. The fake $50 left creases when scrunched up, had different coloured lines, was slightly shorter in length and did not have a coat of arms. Ms Pendlebury said other shop owners in Rockingham, Baldivis and Warnbro had reported receiving counterfeit $50 notes recently.